I have the honor to have been asked to be the next speaker at the local cult favorite speaker series sketchXchange in Portland, OR. This on-going series presented by the community non profit group wemakepdx.com brings in a locally talented artist or designer for 3 hrs for an evening of drinks, sketch book exchanging and a one hour presentation from the featured speaker. 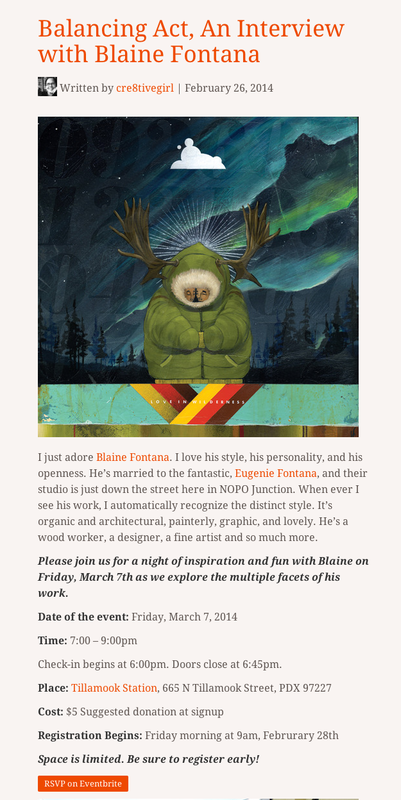 Hosted in the recently renovated Tillamook Station, a stones throw from Fontana Studios, I will be discussing all my successful failures, process and several highlighted projects. Attendees will also be eligible for a bunch of giveaways. Please visit links below for tickets and a touching interview by host and friend Yvonne Perez Emerson. 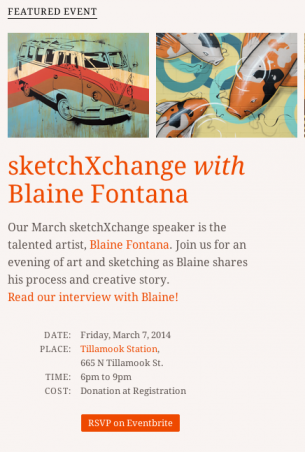 sketchXchange | Blaine Fontana from WeMakePDX on Vimeo.